Home » Forums » Enforcement » Traffic Tickets » Is that considered running a red light in Vancouver BC? Is that considered running a red light in Vancouver BC? I got distracted by something and I only saw the red light late so I slammed the brakes and managed to stop the car, but the front tires entered the crosswalk. I'm sure that intersection has those camera; will I get a ticket for that? I totally came to a full stop but as I said, I kinda entered the crosswalk. Please advise. 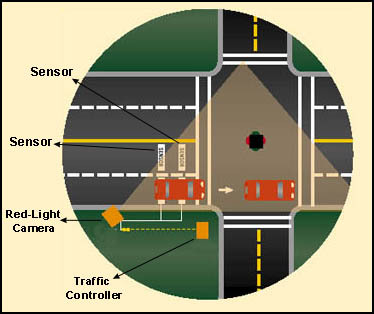 129(1) Subject to subsection (2), when a red light alone is exhibited at an intersection by a traffic control signal, the driver of a vehicle approaching the intersection and facing the red light must cause it to stop before entering the marked crosswalk on the near side of the intersection, or if there is no marked crosswalk, before entering the intersection, and subject to the provisions of subsection (3), must not cause the vehicle to proceed until a traffic control signal instructs the driver that he or she is permitted to do so. If you stopped on top of the crosswalk, technically you are in violation. As you can see in the graphic, if you clear both of the sensors, the system will consider that you have failed to stop as required and take your picture. It is up to the photo reviewer to decide whether to issue the ticket or not based on their criteria.